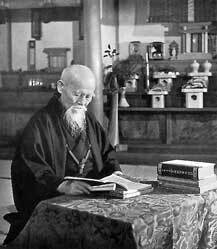 The founder of Aikido, Morihei Ueshiba, was born on December 14, 1883 in Western Japan. Aikido is a relatively new martial art formally established in 1948 but is deeply rooted in the old Samurai traditions. Ueshiba’s Aikido has its origin in Daito Ryu Aikijujutsu which he learned from Sokaku Takeda. Morehei Ueshiba, more commonly known as O-Sensei (Great Teacher) dedicated his life to the study of Budo including Jujutsu, Judo, Sumo Wrestling, Kenjutsu (Sword Arts), Jo and Yari (Stick and Spear) techniques. Aikido is very spiritual in nature; Aikido can be translated as “The Way of Harmony with the Universe or life’s force (Ki).” O-Sensei believed the unification of mind, body and spirit would lead us to a path of peace and resolution without the need for violence. Techniques are mostly throws, control locks, sword, and stick weapons. Aikido is a highly dynamic martial art that is defensive in nature using an attacker’s own size and force against them, thus not requiring great size or strength on behalf of the practitioner. Aikido is a precise harmonizing of body mechanics causing the opponent to defeat themself by their own aggressive action. The schools of Aikido that most influence Aibukan Budo/Aibukan Aikido are; Yoshinkan, Jiyushinkan, Aikikai and Tomiki Ryu. O-Sensei passed away in 1969.